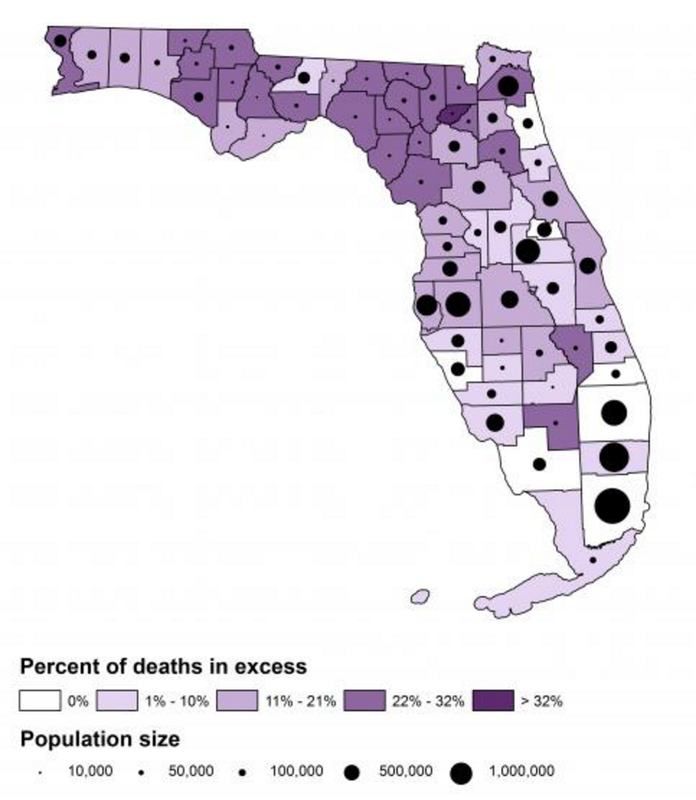 A new study of state death rates shows more Floridians die early in some counties than in others—and researchers have a few ideas about how to change that. The Florida State Health Gaps report from the Robert Wood Johnson Foundation and the University of Wisconsin Population Health Institute examines factors that influence health—everything from smoking and obesity rates, to unemployment, to air pollution—alongside county-by-county death rates. A map of early deaths, controlling for population size, in each of Florida’s counties. “This is really a call to action,” says Dr. Roderick King, a pediatrician and the CEO of the Florida Institute for Health Innovation in Miami. King and the organizations behind this study hope that by highlighting these gaps throughout Florida, communities and policymakers will approach things like employment and housing and police policies as public health opportunities. According to King, it may not be obvious at first, but those are the kinds of things that can have a big impact on health in the long term. The March of Dimes has issued its 2015 report card on early births across the country and Florida gets bad grades for its premature birth rates. The state earned a C this year for having a premature birth rate of 9.9 percent—just about one in every 10 babies born in Florida. The March of Dimes goal is 8.1 percent. In July 2014, Ellen Engelson's leg broke spontaneously, weakened from radiation treatments years before. She lives in Key West, so she went to the emergency room at the only hospital within 50 miles. But because her leg needed specialized care, she had to get to a hospital on the mainland. Depending on where she goes for health care, a Florida woman could spend anywhere from $32 to $494 for a human papillomavirus screening, according to a new analysis from Castlight Health. Castlight is one of the latest organizations to map what Americans are paying for health care. The data for the study come from health care claims provided to Castlight from large, self-insured employers. according to the results of a survey published by the American College of Emergency Physicians (ACEP). “Patients with health insurance were delaying health care decisions—and delayed medical care—because of their fear of high out-of-pocket expenses, high deductibles or high co-insurance,“ says Dr. Andrew Bern, a South Florida emergency physician and a spokesperson for ACEP.